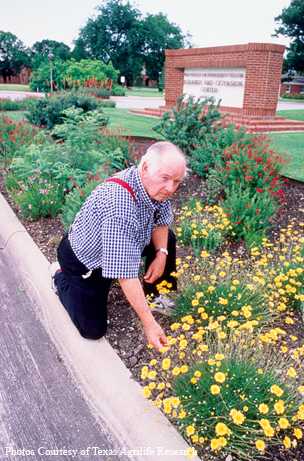 Pioneering horticulturalist Benny Simpson led the crusade for using native Texas plants in landscapes. Some 270 or so miles lie between Dallas and Fredericksburg. Back when Bob O’Kennon — then a commercial pilot based in the Metroplex — owned a ranch west of the Hill Country town, he’d make the trip in less than five hours. Unless Benny Simpson was in the car. 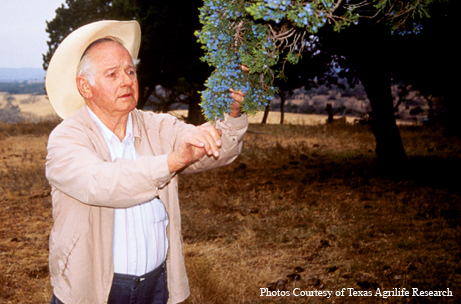 Anyone who knew Simpson — and his deep passion for Texas native flora — knew the drill: Get up long before dawn. Pack some sack lunches, a tarp, an ice chest, a 35mm camera, plenty of film, piles of maps and notepads. Load up the truck, hit the road. After first light came the plant hunting. All day long. Until the sun gave out and not before. Never before. By the time Simpson died in 1996, unexpectedly at age 68, he’d finally acquired the professional respect as a horticulturalist that he’d deserved for so long. Not that he yearned for it too much. Sweet-natured, generous and humble, Simpson started the crusade for using Texas native plants, particularly trees and shrubs, as ornamentals in a time when few listened or cared. Nearly four decades later, O’Kennon, Nokes and others who have followed in Simpson’s footsteps hail him as a pioneer, visionary and scientific explorer. Benny Jack Simpson — born Feb. 29, 1928 — grew up the eldest of four children near the Texas Panhandle town of Northfield. On the family’s small ranch, the only real trees — mesquites didn’t count — stood along the North Pease River. On rare trips to the hard-to-reach riverbanks, young Simpson treasured the time spent among the cottonwoods, maples and shinnery oaks. “I’d get to see the trees and sit under the trees, and I never forgot that,” Simpson told The Dallas Morning News in 1993. After graduation from Matador High School, he enrolled in Texas Tech University to study journalism but dropped out to join the Marines just as World War II was ending. After his discharge two years later, he returned to Tech but was recalled to service when the Korean War started. A year or so later, he went back to Tech. In 1954, he received a bachelor of science degree in agronomy and farm machinery. The devastating drought of the ’50s turned Simpson toward his life’s work with native plants. He’d planned to work with his father after college, but parched conditions made ranching nearly impossible. Instead, he took a job at the Texas Research Foundation, a private agricultural organization in Renner (a farming community that later became a part of Dallas). He never left. For nearly two decades, he studied cotton root rot and planted crops that other researchers studied. In 1972, the foundation donated the Renner facility to Texas A&M University. Simpson stayed on as farm manager. But on the side, his interest in native plants was taking root. Literally. In his free time, he drove to far West Texas, where he searched for native woody plants he thought could be developed as hardy ornamentals in the black soils of North Texas. Empty plots at the Renner center turned into field trials for the many seeds and cuttings he always brought back. 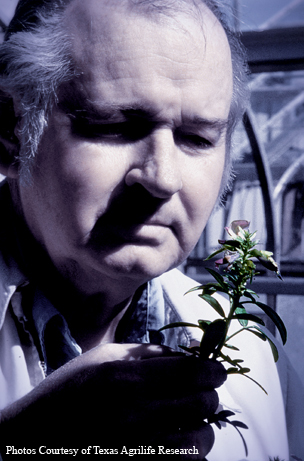 Barney Lipscomb, the Leonhardt chair of Texas botany at the Botanical Research Institute of Texas, met Simpson in the late 1970s while working as a herbarium botanist at Southern Methodist University in Dallas. “Benny would visit the herbarium before a West Texas trip,” Lipscomb recalls. “He’d look up labeled plant specimens and where they’d been collected. Then he’d plot his map and head out. Simpson rarely plant-hunted alone. When they could, the late horticulturalist Lynn Lowrey of Houston and the late botanist Barton Warnock, who specialized in Trans-Pecos flora, went along, too. Simpson succeeded. Under the Texas A&M trademark, he released nine natives for commercial production: five varieties of cenizo, two desert willows, a false indigo and a mountain sage. His impact went beyond state lines. To this day, miles of Green Cloud — a cenizo with green (instead of silvery) foliage and rosy purple flowers — grow along Arizona highways. The sun-loving shrub also graces public and private gardens in Palm Desert, Calif., and Las Vegas, Nev.
Another crony of Simpson’s was the late Carroll Abbott, an expert on Texas wildflowers who founded the Native Plant Society of Texas in 1981 along with Simpson and others. Author Sally Wasowski, a native plant landscape designer, attended the group’s first meeting. Meanwhile, back at the Texas Agricultural Experiment Station in Renner, Simpson had finally scrabbled enough support to land his own research project: “Resource Efficient Plants for Texas and the Southwest.” Still, colleagues scoffed at his plant-hunting trips. “People were saying to me, ‘Hell, we’re just paying you to camp out,’” he told the Morning News. Wayne Mackay, now an environmental horticulture professor at the University of Florida, sometimes hunted with Simpson and Warnock in the Big Bend region. Tim Davis, now head of horticultural sciences at Texas A&M in College Station, had an office next door to Simpson for years. 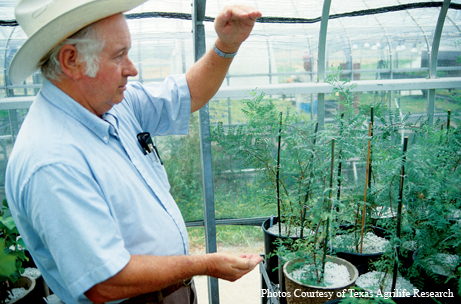 “Benny was a walking encyclopedia of Texas plants,” Davis recalls. “He’d remember exactly where a plant was. He’d tell you to go way down a certain dirt road, turn that way, walk this many feet, and you’ll find this specific plant. That was the last time the two talked. After the procedure, Simpson fell into a coma. Several weeks later, he was taken off life support. On Dec. 27, 1996, Simpson died and was buried on his family’s ranch. In his 43 years of plant hunting, Simpson collected and experimented with more than 500 species. Thanks to him and his followers, many nurseries nowadays stock countless native flowers, shrubs and trees. Wasowski, Nokes and many others have written books on the subject. You may even tend your own wildscape or nativescape. Simply put, “Benny inspired us all,” Wasowski says.